Billing itself as the “world’s first cryptocurrency payment platform to implement consumer protections on a mass scale,” UTRUST has announced that it has joined the Crypto Valley Association. You can read more at utrust.io. In the current ICO boom, few things cause as much concern as the uncertain regulatory environment. Many do expect that at least some token sales will be considered unlicensed sales of securities and that action by the Securities Exchange Commission (SEC) will be forthcoming. Nick Morgan, a former attorney in the SEC’s enforcement division, joined us to discuss the recent report by the SEC on the DAO, how the SEC chooses what kind of cases to prosecute and what their likely next steps will be. Bitboost, which describes itself as a “decentralized trading platform, eliminating the high fees of traditional e-commerce, while adding privacy and encryption,” has joined the Crypto Valley Association. The Ethereum-based platform makes use of smart contract technology and, according to the project, requires no personal information or a bank account to use. More information on the project can be found at bitboost.net. In an interview with CNBC on August 24, Crypto Valley Association President Oliver Bussmann said that over the long term the ICO model “will disrupt the whole IPO business” by providing a transparent, global digital platform that will make it much easier and cheaper for companies to issue equity. Over USD 1.6 billion have been raised in ICOs over the past 12 months, Bussmann said. You can listen to the whole interview on the CNBC site. August 17 was a big day for the Crypto Valley Association in the Swiss media. The visit by the Swiss Economy minister Johann Schneider-Ammann to the CVA not only rated a segment on the Swiss nightly news, it was also the occasion for an in-depth, 30-minute interview with CVA President Oliver Bussmann on Swiss national radio (in German). The wide ranging interview covered a number of topics around blockchain and the Crypto Valley. With the ministerial visit to CVA in mind, Bussmann was first asked how he saw the role of the government in supporting the CVA ecosystem. The good news, he continued, is that the Swiss government has been very active in this area. In financial services, for instance, we have seen the Swiss Fintech license and regulatory sandbox, both of which make it easier for startups to experiment and innovate. But the government’s role goes beyond just financial services. “It is also about the competition between locations,” Bussmann said. “It’s important that a given location be associated with new developments because that helps foster investments in these areas and build up know-how.” Here the government has a clear role too – though it’s important that the authorities find the right balance between consumer protection on the one hand and making it possible for new technologies to establish themselves on the other. Bussmann said the visit of the Economy minister was also important considering the current intense interest in Crypto Valley. The interviewer mentioned criticism that Crypto Valley is attracting lots of capital at the moment, but this has not created many jobs. Bussmann agreed, but felt that that would change. The government of Zug had made a name for itself a while ago when it became the first jurisdiction in the world where people could pay for government services in bitcoin. Recently it made headlines again with the announcement that it was becoming the first community to offer all citizens the option of getting a blockchain-based digital identity. While the interviewer praised this for being admirably progressive, the truth is that very few people have actually used bitcoin in Zug. The interviewer also wanted to know if it made sense to have a digital ID just for one local government. Bussmann countered that even though few had use bitcoin in Zug to date, the experiment is still much more than a PR gag. With it, the government is gaining valuable experience in this technology, which is still extremely new, and that experience will pay off in the future. The same will also surely be the case with the digital ID. The growing ecosystem in Crypto Valley isn’t only attracting interest on the international level. Some of the top politicians in the land are taking notice as well. On Thursday, 17 August, Swiss Economy Minister Johann Schneider-Ammann paid a personal visit to Zug to – in his words – “learn about all this.” He didn’t go away disappointed. During a more than three-hour session held at Lakeside Business Center that was organized by the City of Zug and Lakeside Partners, Mr Schneider-Ammann had an opportunity to learn about blockchain technology and meet several of the top startups in the area. 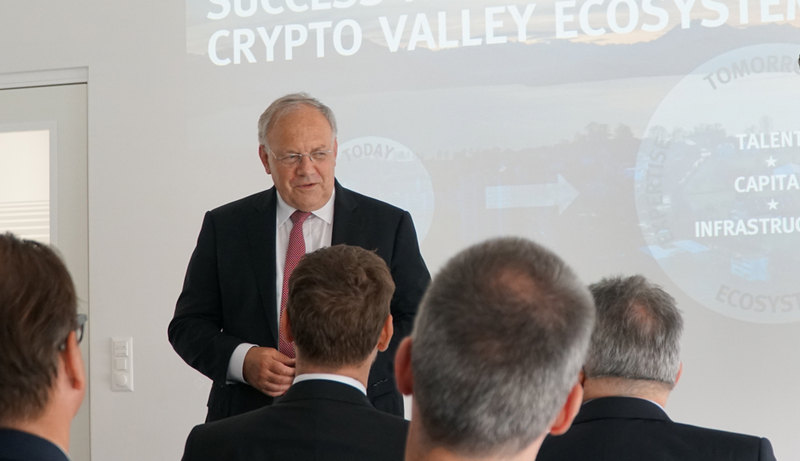 Swiss Economy Minister Johann Schneider-Ammann addresses the Crypto Valley Association. After an introduction by Matthias Michel from the Canton of Zug, Dr Sebastian Bürgel, CTO of Validity Labs gave a concise overview of the theory behind blockchain – including a unique “thought experiment” to illustrate its properties. He was followed by Mathias Ruch, Managing Partner of Lakeside Partners, who outlined the investment perspective for startups seeking to establish themselves in Crypto Valley. He highlighted the potential in talent and infrastructure that is currently attracting blockchain startups to the area – as well as the need for more development and the challenges they face in settling in Switzerland. The “learning experience” for Mr Schneider-Ammann also featured an example of one startup that has committed wholeheartedly to the Crypto Valley ecosystem, Melonport. Its CEO Mona El Isa gave a full demonstration of the asset management platform for crypto assets that Melonport has built over the last months. She was followed by Stephan Karpischek, co-founder of Etherisc – one of the most innovative insurtech startups using blockchain. 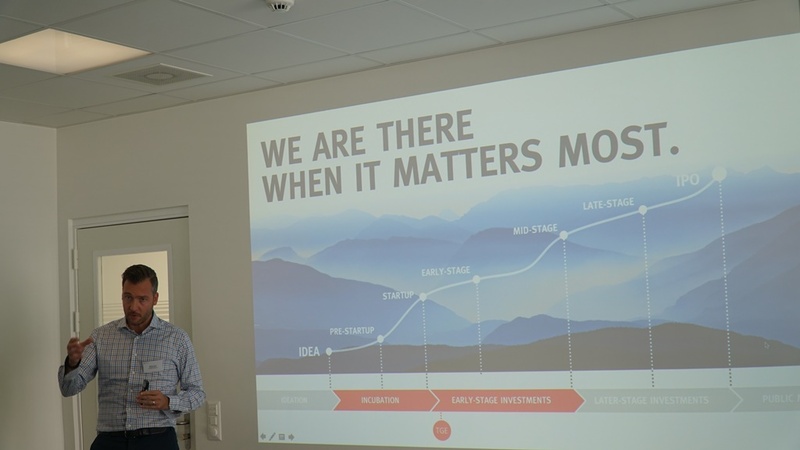 Mathias Ruch, Managing Partner of Lakeside Partners explaining the startup development cycle in the blockchain space. The final portion of the day’s agenda included a roundtable discussion with Mr Schneider-Ammann himself as well as all of the individual speakers plus Managing Director of digitalswitzerland Nicolas Bürer and Melonport CTO Reto Trinkler – and moderated by Crypto Valley Association Treasurer and Professor at the Lucerne School of Applied Sciences René Hüsler. The conversation centered around the possibilities for promoting the expansion of the Crypto Valley ecosystem and the challenges of attracting and keeping foreign talent and creating jobs. The Swiss Federal Councillor’s visit came on a day that saw blockchain and Crypto Valley featured in the news on several other fronts – including a feature from Swiss television station SRF and an interview with Crypto Valley Association President Oliver Bussmann (in German). Prior to hosting his ground breaking podcasts Beyond Bitcoin and The Ether Review, Arthur Falls had left his home country of New Zealand to fish lobster off the coast of Maine. Like many people in the blockchain space, his unlikely journey into the world of decentralized technologies is a fascinating one, and he shares it with us in this episode.